The Tax Cuts and Jobs Act passed in December 2017 affects how taxes will be calculated for the 2018 Fiscal Year. This new tax bill includes many factors on the state of taxes, especially alimony payments. The provisions regarding alimony will only affect alimony agreements made after 2018. If your divorce was not completed with a final judgement, or your alimony agreement was not signed prior to January 1, 2019 then your alimony payments may still be tax deductible. 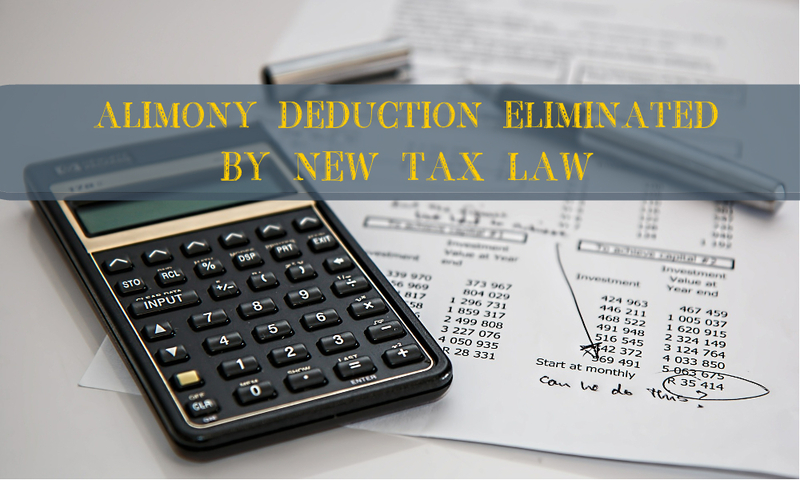 The primary changes in the new tax bill, for agreements made in 2019, means the spouse making alimony payments will not be able to deduct those payments from their taxes while also being responsible for the income tax obligation. The spouse receiving the payment will not have to pay taxes on alimony payments received. The new bill can make negotiations between couples more difficult when discussing finances or even expedite a pending divorce to complete the process before the alimony provisions take effect. Some are concerned because they will receive less money since the paying spouse will be giving more money to the government. Usually the paying spouse is in a higher tax bracket than the receiving spouse is. Alimony awards related to divorce, a written separation agreement or a support decree that occur after January 1, 2019 will be affected by the tax changes. If you have questions about how the new alimony tax deductions are affecting your payments, please call LaFrance Law at 813-930-5542.